e-Delphi; Health Services; Interprofessional Competency; Health Service Managers; Ministry of Health; Oman. In Oman, the education of health professionals appeared to be at an early stage of development and was described as discipline-specific, and thus offered little opportunity for learning interprofessional skills.11 In recent years, health professions such as nursing, medicine, and other allied health professions are working in a uni-professional paradigm. In the meantime, there is a paucity of evidence about ASPs to support health professions and prepare future graduates as managers.4,13 ASPs can bridge the gap between theory and practice, strengthen team cohesion, nurture collegiality, and prevent hierarchical professionalization and compartmentalization of each discipline. The healthcare system in Oman is looking forward to improving its quality of care as a collaborative practice. There are other issues that Oman is currently facing. The Ministry of Health (MoH) surmised that there is a radical demographic and epidemiologic transition, aging, and a predominance of non-communicable diseases and injuries, as well as other concerns related to political, economic, social, technological, environmental, and legal aspects.14 Thus, the MoH’s Health Vision 2050 was developed to serve as a schematic blueprint, which focuses on the critical role of education in developing effective and efficient human resources for health.14,15 This roadmap also hopes to empower the academic and service industries in preparing future leaders and managers in meeting the increasing demands of its growing population. This study utilized a multiple methods research design comprising of qualitative content analysis and a three-round e-Delphi technique.18 The use of qualitative content analysis guided the researchers to understand the multifaceted dimensions of participants’ views through systematic coding and categorizing emerging statements.19 The e-Delphi study design was used to obtain expert panel opinions to facilitate the development of interprofessional competencies for health service managers. This technique utilized a series of sequential rounds that sought to gain a reliable consensus from a group of experts.20–27 Despite the integration of many strategies, the format always followed a series of rounds of data collection and analysis. An e-Delphi technique is an environmentally friendly approach to research that leads to rapid feedback and responses from an expert panel.26 Donohoe et al,27 surmised that using e-Delphi, participants could have access to the virtual laboratory or online platform that saves time, effort, and cost. The Institutional Review Board reviewed the proposal, and the study was approved by the MoH independent ethics committee. Following approval, a consultative meeting was initiated to identify the selected panel of experts from different healthcare institutions. Twenty experts were nominated based on their position, educational requirement, and work experience. Experts had to be knowledgeable, with at least five years experience in administration, leadership, and management to participate in the study. There were three rounds and a web-based designed survey used for data collection. Ten experts who met the inclusion criteria were included in a pilot study and underwent three rounds and a similar platform to determine the usability and clarity of the questions and instructions included. In round one, the eligible experts were provided with a one-day seminar workshop to provide a background of the research study, its purpose, objectives, outcomes, expectations, and process. Each participant was given a study kit manual and the dates of the next round. The SurveyMonkey® URL website and password were included. Informed consent was obtained; confidentiality and anonymity were given emphasis. Two weeks were given as a waiting period for an expert to respond and they were reminded every week via email. In round two, a blind email was sent to the experts with the identified competencies generated from round one. The researchers analyzed the results and the extracted responses were combined to those with similar context to formulate specific themes using NVivo® (QSR International Pty Ltd. Version 11.4.0). Experts were contacted for clarity and refinement of ambiguous terminologies. The completed responses based on the constructed themes were sent via email for further suggestions and recommendations. In round three, experts were contacted by email with the final list of the competencies to evaluate the level of importance of each identified domain and indicator. In round one, an open-ended question was introduced to the experts. The question for round one was: “What are the required interprofessional competencies for health service managers in Oman?” Members of the panel were asked to list down all the required interprofessional competencies for health service managers. The researchers met for several weeks for coding, categorizing, and thematization until the statements were saturated.18,19 The themes and statements were sent to the experts for their review and clarification. In round two, the completed responses based on the constructed themes were sent via email for further suggestions and recommendations. In round three, experts were instructed to rate the level of importance using a 5-point Likert Scale from very unimportant (1) to very important (5). Responses were analyzed using SPSS Statistics (IBM Corp. Released 2015. IBM SPSS Statistics for Windows, Version 23.0. Armonk, NY: IBM Corp.) to determine the mean values, interquartile range (IQR), and frequency. The accepted competencies were established with means ≥ 4.4, an interquartile distribution (IQD) ≤ 1.25, and when the consensus reached 80.0%. Table 1 presents the profile characteristics of the participants. Based on the findings, 20 experts were informed and consented to participate in the study from various health professions including nursing (n = 6, 30.0%), medicine (n = 3, 15.0%), laboratory science (n = 3, 15.0%), pharmacy (n = 4, 20.0%), medical imaging science (n = 2, 10.0%), and physiotherapy (n = 2, 10.0%). Sixty-five percent (n = 13) of participants were from clinical practice, and the majority had 5–14 years experience (n = 16, 80.0%). The majority of participants were 30–39 years old (n = 16, 80.0%) and female (n = 14, 70.0%). Seventy-five percent of the participants had a master’s degree (n = 15), 10.0% had a doctorate (n = 2), and 15.0% were medical doctors (n = 3). Table 1: Profile characteristics of the experts (n = 20). Table 2: Overall interprofessional competency domains based on the level of importance (n = 20). Statements with a mean ≥ 4.4 and IQD ≤ 1.25 and where consensus reached 80.0% were considered to have a higher level of importance. Twenty experts were informed, consented, and validated the final lists of the competencies. From the lists, nine domains and 41 emerging statements reached the consensus of agreement among the experts’ criteria. The statements with means (M) ≥ 4.4 and IQD ≤ 1.25 and where the consensus reached 80.0% were considered to have a higher level of importance. Table 2 presents the overall themes based on qualitative content analysis. There was 90.0% to 95.0% level of agreement among the experts on the nine interprofessional competency domains, which included: resilience (M = 4.7, IQD = 0.40), research leverage (M = 4.7, IQD = 0.60), interprofessional ethics (M = 4.7, IQD = 0.80), quality improvement (M = 4.7, IQD = 0.80), IT (M = 4.6, IQD = 0.80), leadership (M = 4.5, IQD = 1.00), management skills (M = 4.5, IQD = 0.80); communication (M = 4.5, IQD = 1.00), and team dynamics (M = 4.5, IQD = 1.00). Table 3 represents the interprofessional competencies along with the indicators and level of importance as evaluated by the panel of experts. Each domain comprised of three to five indicators. Table 3: Interprofessional competency indicators and level of importance (n = 20). Is patient, tenacious, and resourceful when seeking information to satisfy a request or complete a project. Deals effectively with pressure and remain optimistic and persistent, even under adversity. Maintains progress when handling multiple tasks and projects, even under stressful situations or when faced with competing deadlines. Utilizes critical thinking in decision making concerning the organization, patients, families, communities, and own profession. Has a sound background in research process (e.g., conceptualization, planning, empirical, analysis, dissemination, and translation). Continues to integrate evidence to inform the health professions on effective service improvement initiatives. Advocates research as a tool towards knowledge management and restructuring of the organization whenever necessary. Able to translate the available findings from scholarly works to support organizational performance. Commits oneself in producing scientific outputs relevant to patient care, customer service initiatives, and overall organizational success. Builds consensus based on the ethical principles regarding planning, directing, organizing, and controlling. Cultivates mutual respect and shared values for the health profession and practice. Promotes a productive culture by valuing individuals and their contributions. Acts with honesty and integrity in relationships with patients, families, and other team members. Appreciates cultural diversity and inclusion of each health profession. Engages in continuous professional and interprofessional development to enhance team performance. Uses both internal and external sources of feedback for insight and engagement in self-regulation and improvement. Uses quality improvement approaches and strategies to heighten interprofessional collaboration and teamwork. Measures competencies of each unit where collaboration is in effect. Understands the principles upon which organizational and professional health information system used by healthcare professionals and patients are based. Evaluates information and its sources critically and incorporates selected information into his or her knowledge and value system. Assures confidentiality of protected patient health information when using health information systems under his or her control. Understands and uses the Internet and the World Wide Web. Knows various types of health information systems, their clinical, and administrative uses. Establishes goals, deliverables, timelines, and budgets. Develops future leaders by being involved in the organization-wide mentoring program. Leads process improvement programs in all major systems falling under the area of control. Holds responsible for providing measurable, timely, cost-effective, and high-quality results. Formulates objectives and priorities and implements plans consistent with the long-term interests of the organization. Designs approaches and procedures to develop a strategic plan. Acknowledges organizational strengths and develops a plan to address areas needing improvement. Develops innovative customer service initiative which significantly improves quality and enhances customer satisfaction. Able to integrate the organization’s vision despite professional differences. Communicates plans and activities in a manner that supports the entire organization. Expresses oneself effectively both orally and in written form. Values the diversity of the organization to develop trusting and professional working relationships with the patients, families, communities, and colleagues. Skillfully settles differences by using a win-win approach to maintain trusting working professional relationships. Collaborates with other professionals in an interactive open communication and interpersonal skills. Shares responsibility and accountability with other professions toward patient’s and organization’s outcomes. Appreciates the process of teamwork and team development. In 2008, Oman was ranked 84th out of 184 countries in the Human Development Index, an increase from previous years. The country is considered as showing high human development by the United Nations Development Program.14 The MoH has been an instrument in the development of a sustainable workforce and needs to continue strengthening the resources for human health. Oman needs a workforce recognized as stewards and key players in policy analysis and development, strategic planning, standard setting and regulation, organization of service provision, ensuring intersectoral coordination, and the monitoring and evaluation of health plans implementation.14 Hence, this study was conducted as a moral commitment and social responsibility of the researchers to be part of leveraging the required competencies for future health service managers. The Interprofessional Competency Framework hopes to motivate and empower current and future leaders to advance practice, inform policy, and transform the health system. The proposed framework is grounded on the MoH’s Health Vision 2050 and the WHO Framework for Action on Health System to ensure a strategic alignment based on country-specific needs1,14 and fit-for-purpose competencies, which will be required in the coming years. Interprofessional ethics is also an enabling competency for health service managers. This domain codifies the foundation toward work values, value integration, and value-based management. Interprofessional ethics will guide the implementation of effective management processes. Engel and Prentice34 mentioned that collaboration is a relational process that operates within a framework of moral action and moral integrity. Healthcare organization is a diverse system and is exposed to many sentinel events that may affect operation, interaction with others, and even the organization’s overall performance. Thus, interprofessional ethics can alleviate the conundrum of conflicts, fragmented health care, and compartmentalization of various health professions because the collaborative practice needed focuses on patient-centricity and a humanistic component of care segregating the health profession differences. Further, through embodied interprofessional ethics, the code of professionalism and code of conduct can be developed to guide practice, which is grounded in mutual understanding and respect while in a diverse and inclusive environment.35 Managers need to integrate quality practice to improve the organization, patient services, and interprofessional work environment through quality improvement initiatives. Managers should engage in continuous professional and interprofessional development to enhance team performance and efficient uses of resources (both internal and external).17,36 Quality improvement is the consolidated effort of the service providers, patients, and their families, payers, policymakers, educators, and stakeholders. In an era of healthcare driven by biological and technical advances, sustained quality improvement and quality service produce better patient outcomes, better system performance, and better professional development.37–39 Quality improvement purports that at all levels of the organization, each member needs to be empowered to deliver individualized, holistic, and patient-centered care. The MoH mentioned that “an effective health system requires increasing numbers of other human resources in categories such as health economists, clinical statisticians, health planners, and health system researchers”.14 In a similar vein, the MoH needs an initial boost to increase numbers of human resources to face shortages. 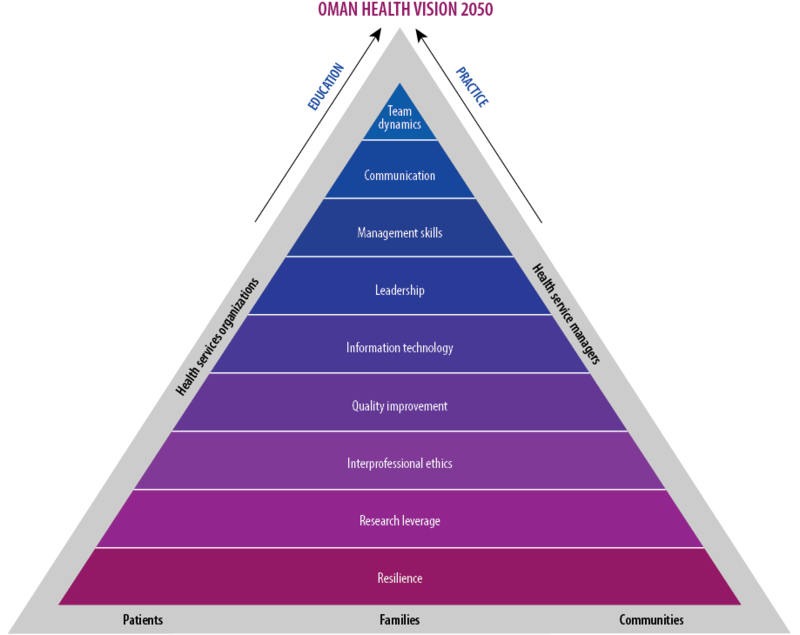 These human resources for health, which are needed and required, should understand and cultivate leadership best practices to achieve the organization’s vision and mission aligned with the Health Vision 2050. According to Kim et al,41 a hospital requires effective leadership to influence others in providing safe, effective, efficient, equitable, patient-centered, and quality health services. The interprofessional leadership along with the teamwork, coordination, communication, and collaboration can further improve patient-centered and family-centered practices. However, territorial behavior has been observed among professional groups and agencies, which was considered a deterrent to interprofessional collaboration.42 Managers who have the mindset to defend their territories in a bureaucratic organization may result in these behaviors. Thus, to alleviate these barriers, altruistic leadership has been found to be substantially grounded in concern for others, the organization, and society. Interprofessional communication reflects the ability to communicate respectfully and responsively with others including patients, families, communities, and colleagues in a diverse working environment, regardless of race, religion, place of origin, language, socioeconomic status, and background. Communication, though a fundamental component of active management, is highly integral to the strengthening teamwork and collaboration. Matziou et al,46 mentioned that through open communication, there would be mutual understanding and collaborative relationships. Despite physicians and nurses varying in views about their practice, open communication will strengthen their relations because there is trust, respect, and shared accountability.38 Undeniably, the health system is in rapid transformation, and managers need to continue as both beacon and steward to build a collaborative practice and milieu that will require understanding how teams work together.47,48 The interprofessional teamwork should be efficient, open, and equitable tactical, with shared responsibility and influence.49 Shoham et al,47 recommended evaluating the communication process regarding types, quality, and dynamic nature of interprofessional interaction so that managers can determine the areas for improvement. This study offers a novel contribution to the emerging era of Internet research. We used a multi-method approach using qualitative content analysis and e-Delphi technique to ensure the accuracy of the findings where country-specific expert opinions were illuminated. The use of e-Delphi is cost-effective and provides access to an expert opinion without geographical limitations or the time restrictions placed on face-to-face data collection,22 and the anonymity prevents undue influence and other expert dominance. Further, the use of a web-based design survey (i.e., SurveyMonkey®) provides a virtual platform without geographical limitations, minimizes the issues in handwriting, and eases the data entry. Owing to the limitation of this study, although 20 experts were consulted, the response rate yielded more than 80.0%. The development of interprofessional competency domains for managers in various healthcare organizations is imperative. The academic and service industries have the responsibility to prevent compartmentalization of the health professions through the integration of IPE where the collaborative practice is envisioned. The growing demand for interprofessional managers who have the resilience, research background, ethics, quality improvement, IT, leadership and management, communication, and team dynamics are needed. Those managers who have the fit-for-purpose competencies can further address the challenges faced. Thus, the MoH needs to empower both academic and service industries to develop graduates into holistic leaders and managers through IPE integration to fully become an instrument in the realization of the Health Vision 2050. The interprofessional competency domains will also prepare future health service managers to become more adaptive, responsive, with the integral component of progressive reforms toward safe, quality, and sustained health outcomes at the macro-level grounded in collaboration, collegiality, and mutual trust between the academic and service sectors. 1. Framework for action on interprofessional education and collaborative practice. World Health Organization. Health workforce 2010 [cited 2018 May]. Available from: http://who.int/hrh/resources/framework_action/en/. 2. Barr H, Koppel I, Hamminck M, Freeth D. Effective Interprofessional Education: Assumption, Argument and Evidence. London: Blackwell; 2005. 3. Brandt BF, Cerra FB, Delaney CW. The United States National Center for Interprofessional Practice and Education: Integrating an informatics approach to interprofessional work. J Interprof Care 2015;29(6):592-595. 4. Rajamani S, Westra BL, Monsen KA, LaVenture M, Gatewood LC. Partnership to promote interprofessional education and practice for population and public health informatics: A case study. J Interprof Care 2015;29(6):555-561. 5. Centre for the Advancement of Interprofessional Education. What is CAIPE? 2018 [cited 2018 May]. Available from: https://www.caipe.org/about-us. 6. Haruta J, Sakai I, Otsuka M, Yoshimoto H, Yoshida K, Goto M, et al. Development of an interprofessional competency framework in Japan. J Interprof Care 2016 Sep;30(5):675-677. 7. El-Awaisi A, Wilby KJ, Wilbur K, El Hajj MS, Awaisu A, Paravattil B. A Middle Eastern journey of integrating Interprofessional Education into the healthcare curriculum: a SWOC analysis. BMC Med Educ 2017 Jan;17(1):15. 8. Brazeau GA. Interprofessional education: more is needed. Am J Pharm Educ 2013 Nov;77(9):184. 9. McNeal GJ. Interprofessional education: an IOM imperative. ABNF J 2013;24(3):69-70. 10. Nandan M, Scott PA. Interprofessional practice and education: holistic approaches to complex health care challenges. J Allied Health 2014 Aug;43(3):150-156. 11. Inuwa IM. Interprofessional Education (IPE) activity amongst health sciences students at sultan qaboos university. Sultan Qaboos Univ Med J 2012 Nov;12(4):435-441. 12. Al Harthy SN, Al Subhi N, Tuppal C, Reñosa MD. A systematic review of the selected evidence on the effectiveness of interprofessional education (IPE) in developing interprofessional learning environment. Nurse Media Journal of Nursing 2016;5(2):76-87. 13. Tuppal C, Reñosa M, Al Harthy S. Extent of collaboration in building academic – service partnerships in nursing. Nurse Media Journal of Nursing. 2016;6(2):47-58. 14. Ministry of Health. Health Vision 2050. In: Undersecretariat for Planning Affairs. 1st ed. Sultanate of Oman: Ministry of Health; 2014. 15. Al-Riyami A. Health vision 2050: A committed step towards reforms. Oman Med J 2012 May;27(3):190-191. 16. American Interprofessional Health Collaborative. What is AIHC? 2018 [cited 2018 May]. Available from: https://aihc-us.org/what-is-aihc. 17. Dobson RT, Stevenson K, Busch A, Scott DJ, Henry C, Wall PA. A quality improvement activity to promote interprofessional collaboration among health professions students. Am J Pharm Educ 2009 Jul;73(4):64. 18. Wallace SJ, Worrall L, Rose T, Le Dorze G. Core outcomes in aphasia treatment research: An e-delphi consensus study of international aphasia researchers. Am J Speech Lang Pathol 2016 Dec;25(4S):S729-S742. 19. Dİnçer S. Content analysis in for educational science research: Meta-analysis, meta-synthesis, and descriptive content analysis. Bartın University Journal of Faculty of Education 2018;7(1):176-190. 20. Holloway K. Doing the e-Delphi: Using online survey tools. CIN: Computers, Informatics. Nursing. 2012;30(7):347-350. 21. Cole ZD, Donohoe HM, Stellefson ML. Internet-based Delphi research: case based discussion. Environ Manage 2013 Mar;51(3):511-523. 22. Murphy K, Walker K, Duff J, Williams R. The collaborative development of a pre-operative checklist: An e-Delphi study. Journal of Perioperative Nursing in Australia. 2016;29(1):36-43. 23. Taylor RM, Feltbower RG, Aslam N, Raine R, Whelan JS, Gibson F. Modified international e-Delphi survey to define healthcare professional competencies for working with teenagers and young adults with cancer. BMJ Open 2016 May;6(5):e011361. 24. Toronto CE. Health literacy competencies for registered nurses: An e-Delphi Study. J Contin Educ Nurs 2016 Dec;47(12):558-565. 25. Vaughan-Graham J, Cott C. Defining a Bobath clinical framework - A modified e-Delphi study. Physiother Theory Pract 2016 Nov;32(8):612-627. 26. Keeney S, McKenna H, Hasson F. The Delphi technique in nursing and health research. John Wiley & Sons; 2011. p. 1-17. 27. Donohoe H, Stellefson M, Tennant B. Advantages and limitations of the e-Delphi technique: Implications for health education researchers. Am J Health Educ 2012;43(1):38-46. 30. Robertson HD, Elliott AM, Burton C, Iversen L, Murchie P, Porteous T, Matheson C. Resilience of primary healthcare professionals: A systematic review. The British Journal of General Practice. J R Coll Gen Pract 2016;66(647):e423-e433. 31. Matheson C, Robertson HD, Elliott AM, Iversen L, Murchie P. Resilience of primary healthcare professionals working in challenging environments: a focus group study. Br J Gen Pract 2016 Jul;66(648):e507-e515. 32. Banaszak-Holl JP, Zheng KP, Griffith JR. Critical next steps in developing evidence-based management of health care organizations. Health Care Management Review July/September. 2009;34(3):219-221. 33. Arndt M, Bigelow B. Evidence-based management in health care organizations: A cautionary note. Health Care Management Review 2009;34(3):206-213. 34. Arndt M, Bigelow B. Response to the commentaries: evidence-based management in health care organizations: A cautionary note. Health Care Management Review 2009;34(3):222-223. 35. Al Mawali AH, Al Qasmi AM, Al Sabahi SM, Idikula J, Elaty MA, Morsi M, et al. Oman vision 2050 for health research: A strategic plan for the future based on the past and present experience. Oman Med J 2017 Mar;32(2):86-96. 36. Engel J, Prentice D. The ethics of interprofessional collaboration. Nurs Ethics 2013 Jun;20(4):426-435. 37. Hewison A, Sim J. Managing interprofessional working: using codes of ethics as a foundation. J Interprof Care 1998;12(3):309-321. 38. Thompson SA, Tilden VP. Embracing quality and safety education for the 21st century: building interprofessional education. J Nurs Educ 2009 Dec;48(12):698-701. 39. Batalden PB, Davidoff F. What is “quality improvement” and how can it transform healthcare? Qual Saf Health Care 2007 Feb;16(1):2-3. 40. Alrashdi I, Al Qasmi A. Staff perception of relative importance of quality dimensions for patients at tertiary public services in Oman. Oman Med J 2012 Sep;27(5):396-401. 41. Al-Abri R, Al-Balushi A. Patient satisfaction survey as a tool towards quality improvement. Oman Med J 2014 Jan;29(1):3-7. 42. Alam MG, Masum AK, Beh L-S, Hong CS. Critical factors influencing decision to adopt human resource information system (HRIS) in hospitals. PLoS One 2016 Aug;11(8):e0160366. 43. Kim CS, King E, Stein J, Robinson E, Salameh M, O’Leary KJ. Unit-based interprofessional leadership models in six US hospitals. J Hosp Med 2014 Aug;9(8):545-550. 44. Axelsson SB, Axelsson R. From territoriality to altruism in interprofessional collaboration and leadership. J Interprof Care 2009 Jul;23(4):320-330. 45. Rabbani F, Hashmani FN, Mukhi AA, Gul X, Pradhan N, Hatcher P, et al. Hospital management training for the Eastern Mediterranean Region: time for a change? J Health Organ Manag 2015;29(7):965-972. 46. Palumbo R. Contextualizing co-production of health care: a systematic literature review. Int J Public Sector Management 2016;29(1):72-90. 47. Ranjan KR, Read S. Value co-creation: Concept and measurement. Academy of Marketing Science Journal 2016;44(3):290-315. 48. Matziou V, Vlahioti E, Perdikaris P, Matziou T, Megapanou E, Petsios K. Physician and nursing perceptions concerning interprofessional communication and collaboration. J Interprof Care 2014 Nov;28(6):526-533. 49. Shoham DA, Harris JK, Mundt M, McGaghie W. A network model of communication in an interprofessional team of healthcare professionals: A cross-sectional study of a burn unit. J Interprof Care 2016 Sep;30(5):661-667. 50. Molyneux J. Interprofessional teamworking: what makes teams work well? J Interprof Care 2001 Feb;15(1):29-35. 51. Hewitt G, Sims S, Harris R. Evidence of communication, influence and behavioural norms in interprofessional teams: a realist synthesis. J Interprof Care 2015 Mar;29(2):100-105. 52. Winterbottom F, Seoane L. Crossing the quality chasm: it takes a team to build the bridge. Ochsner J 2012;12(4):389-393. 53. Song H, Ryan M, Tendulkar S, Fisher J, Martin J, Peters AS, et al. Team dynamics, clinical work satisfaction, and patient care coordination between primary care providers: A mixed methods study. Health Care Manage Rev 2017 Jan/Mar;42(1):28-41. 54. Wilbur K, Hasnani-Samnani Z, Kelly I. Interprofessional education activity among undergraduate nursing and pharmacy students in the middle east. Nurse Educ 2015 Jul-Aug;40(4):163-164. 55. Kapral O. Healthcare managers on interprofessional teams. J Interprof Care 2011 Jan;25(1):77-78. 56. Mitchell R, Parker V, Giles M, Boyle B, Boyle B. The ABC of health care team dynamics: understanding complex affective, behavioral, and cognitive dynamics in interprofessional teams. Health Care Manage Rev 2014 Jan-Mar;39(1):1-9.